Gary Sutkin, M.D., has received a $600,000 research grant from the National Institutes of Health to develop technology that will make surgeries safer. The School of Medicine recognized 36 faculty members who recently received promotions and tenure and presented six special awards for faculty and student achievements during a reception on Sept. 28 at Diastole. This year’s list included 12 faculty promotions to the rank of professor and 24 to the rank of associate professor. Visit the School of Medicine web site for the complete list of faculty promotions. 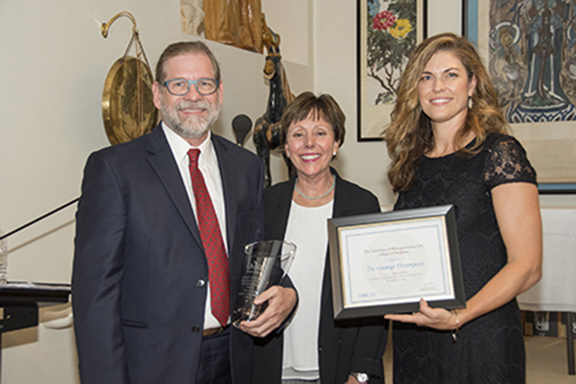 George Thompson, M.D., associate professor of psychiatry, received the third-annual award that recognizes someone who has contributed to innovation and scholarship in medical education. Thompson says his goal in medical education is to support students in fully integrating humanism, good communication, and professionalism into their practice of competent biological medicine. He has served as course director for the School of Medicine’s courses on fundamentals of medical practice and CUES to medical communication. A nomination letter recognized him for nurturing medical professionalism in his students. The fifth-annual awards were presented to faculty members for their excellence in mentoring, guiding, coaching and sponsoring students, trainees, staff and peer faculty. These awards recognize an individual or organization that has demonstrated sustained and impactful contribution to diversity, inclusion and cultural competency or health equity. The award is given to a student or student organization, and to faculty, staff, resident and/or organization/department. 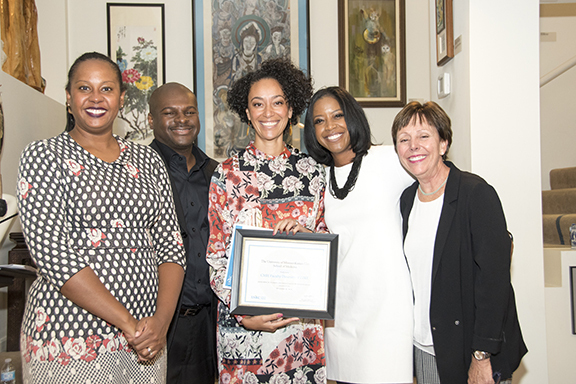 Taylor Carter, a sixth-year medical student received the student award for her leadership and service with many school and national organizations. A member of Student National Medical Association, a national organization representing underrepresented minority medical students, since 2013, she currently serves as chair of the national academic affairs committee. 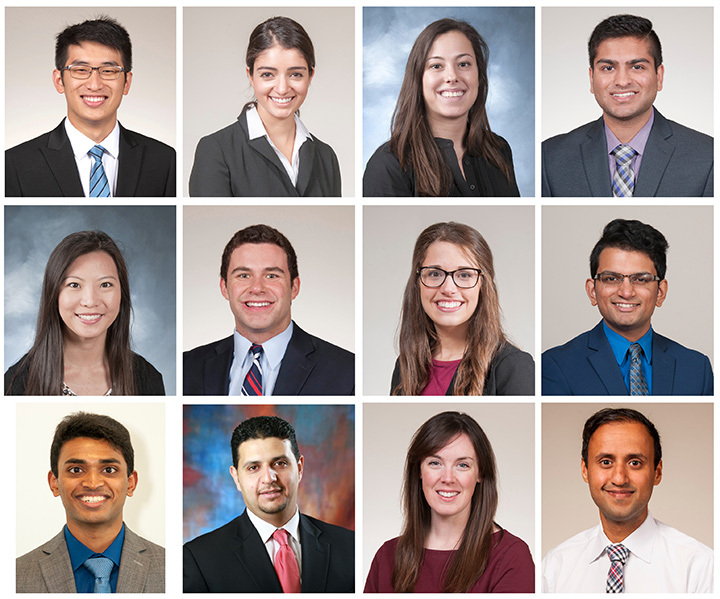 Carter has also served as a School of Medicine student representative to the diversity council as well as a student representative to the Children’s Mercy Diversity General Medical Education Sub-Committee. She works with School of Medicine partners on cultural competency curriculum reform to improve the student training in areas such as social determinants of health, personal biases and treating individuals from different backgrounds. Two groups, the UMKC Student National Medical Association (SNMA) and the Children’s Mercy Hospital Faculty and Trainee Diversity, Equity and Inclusion (FTEDI) Committee, received diversity awards for organizations. In the past year, the school’s SNMA chapter currently partnered with the Linwood YMCA to provide members who assist with its events, including the Launchpad after-school program, tutoring and mentoring middle and high school students. The chapter has also initiated new programming including a cultural competency workshop and a campus Living Culture event to celebrate diversity. For the past nine years, the organization has conducted a Black History Month Celebration that allows students to display their talents, while educating the audience about health issues that predominately affect the African American and Hispanic population. 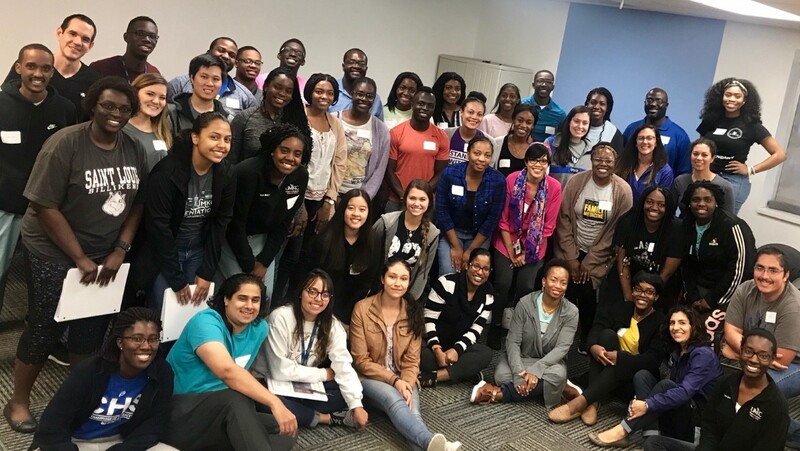 The Children’s Mercy FTEDI Committee began as a grassroots effort led by physicians Bridgette Jones, Tamorah Lewis and Jaszianne Tolbert to improve diversity among the pediatrics residency class. The group has since implemented initiatives producing active national recruitment outreach to underrepresented minority trainees and faculty candidates, bias training for hospital leadership, a visiting professorship by national leaders and an elective for minority medical students. 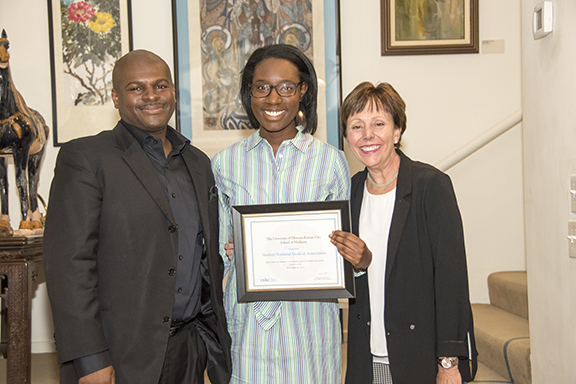 Chizitam Ibezim, right, won the School of Medicine’s first prize for his poster presentation at the 2018 UMKC Heath Sciences Student Research Summit. 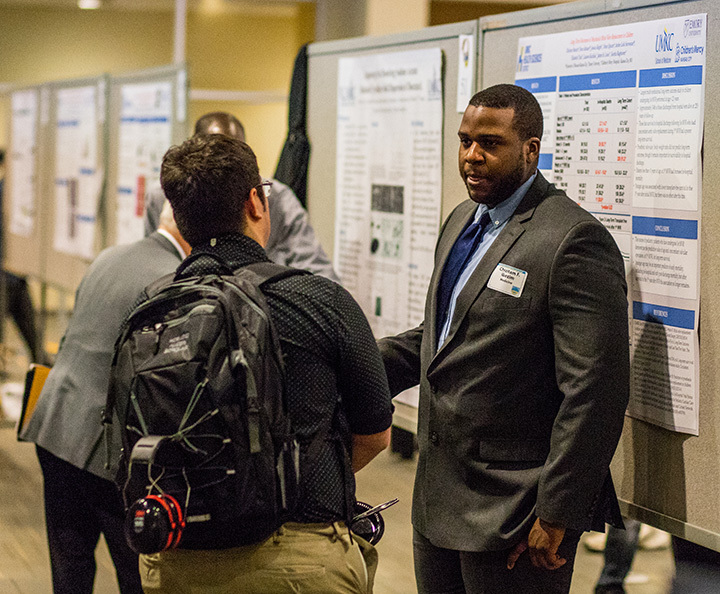 Fourth-year medical student Chizitam Ibezim won first prize for his poster presentation at the annual UMKC Health Sciences Student Research Summit on April 18 at the Student Union. Ibezim was among the 50 UMKC School of Medicine students who participated in this year’s summit. They presented 45 of the event’s 87 posters. Students from the health sciences schools of dentistry, nursing and health studies, and pharmacy, as well as the School of Biological Sciences, also presented posters. The School of Medicine’s Office of Research Administration presented three awards for student presentations and one top prize for graduate student presentations. Firas Al Badarin, M.D., M.S.C.R., won the first prize for his graduate student presentation, “Utilization of Radiation-Saving Practices with Myocardial Perfusion Imaging: Temporal.” John Spertus, M.D., was his faculty mentor. Second prize for a student presentation was awarded to Kelly Kapp, sixth-year student, for “Cardiac Valve Replacement Associated with Higher Values of Glycocalyx Production in Viridan Streptococcal Endocarditis.” She was mentored by Lawrence Dall, M.D. School of Medicine faculty members served as judges at the event. They included: Darla McCarthy, Ph.D., Jeffrey Price, Ph.D., Maria Cole, Ph.D., Kim Smolderen, Ph.D., R. Scott Duncan, Ph.D., Sean Riordan, Ph.D., Mian Urfy, M.D., Lakshmi Venkitachalam, Ph.D., Nilofer Qureshi, Ph.D., Felix Okah, M.D., Peter Koulen, Ph.D., Bridgette Jones, M.D., Karl Kador, Ph.D., Dan Heruth, Ph.D., Shui Ye, Ph.D., and Gary Sutkin, M.D., M.B.A. The research office also thanked Tim Hickman, M.D., M.P.H., for conducting student presentation practice sessions. John Foxworth, Pharm.D., was also acknowledged for reviewing posters with students to prepare for the event. The Kansas City Medical Society recognized Richard Hellman, M.D., F.A.C.P., F.A.C.E., a former School of Medicine docent and clinical professor of medicine, with its 2017 Lifetime Achievement Award. It is the organization’s highest honor. Hellman served as a docent for nine years before stepping down in 1981 to design and direct Kansas City’s first comprehensive program for adult diabetes care. The practice now includes a 21-member multidisciplinary team, emphasizing a patient-centered integrative approach linking education and medical care. 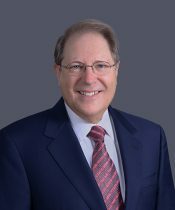 Hellman served on the board and as president of the American Association of Clinical Endocrinologists, which in 2016 presented him with its Outstanding Clinical Endocrinologist Award. He also has been active with the American Medical Association-convened Physician Consortium for Performance Improvement. Founding editor of the AACE patient safety exchange web site, Hellman has also served as section editor for Internal Medicine World Report and a reviewer for many other journals. He served as president of the Kansas City Medical Society in 2000 and in 2015 received the organization’s Innovation Award for his accomplishments. Joshua M.V. Mammen, 2017 society president, said Hellman had helped to advance medical knowledge through his publications and service to national and international organizations. “Dr. Hellman has been a leader and innovator in the practice of diabetes care and also in the areas of patient safety and performance measurement, both locally and internationally,” Mammen said. 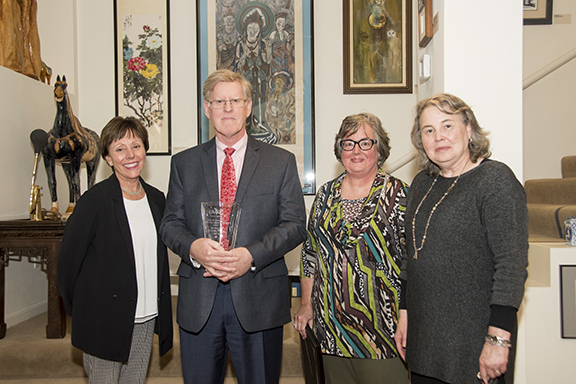 The medical society recognized Gary Pettett, M.D., professor emeritus and a past associate dean for the School of Medicine with the same award. He received the organization’s 2016 Lifetime Achievement Award. The Kansas City Medical Society represents medical and osteopathic physicians throughout the greater Kansas City area. Third-year medical student Hunter Faris, left, has received a research award to work with John Q. Wang, M.D., Ph.D., Westport Anesthesia/Missouri Endowed Chair in Anesthesia Research. Third-year medical student Hunter Faris has been selected for a student research award from the UMKC strategic funding award initiative, Project ADVANCER (Academic Development Via Applied aNd Cutting-Edge Research). The program supports research projects of UMKC undergraduate and professional students from underrepresented minorities. Faris will be working with faculty mentor, John Q. Wang, M.D., Ph.D., Westport Anesthesia/Missouri Endowed Chair in Anesthesia Research, to establish a previously unrecognized mechanism underlying the regulation of neuronal activities. His project, Regulation of Src Family Protein Kinases in the Rat Striatum by Muscarinic Acetylcholine Receptor, could significantly advance the knowledge of receptor signaling and protein kinases biology. Project ADVANCER is a UMKC initiative to provide students the opportunity to gain experience and build a “track record” in research. That experience will provide students better access to competitive postgraduate training such as residencies or graduate programs and, ultimately, to better employment opportunities. Students who have identified a UMKC faculty mentor in the College of Arts and Sciences, Department of Geosciences; School of Biological Sciences; School of Computing and Engineering; School of Medicine; or School of Nursing and Health Studies may jointly develop an application for a Project ADVANCER award with their faculty mentor. Faris and Wang expect to produce results that will be published in a peer-reviewed scientific journal. 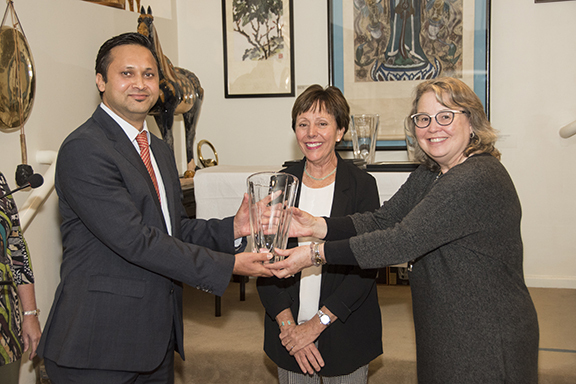 Jill Moormeier, M.D., chair of internal medicine, presented Amgad Masoud, M.D., assistant professor of medicine, with 2017 Outstanding Year 1 and 2 Docent Teaching Award. 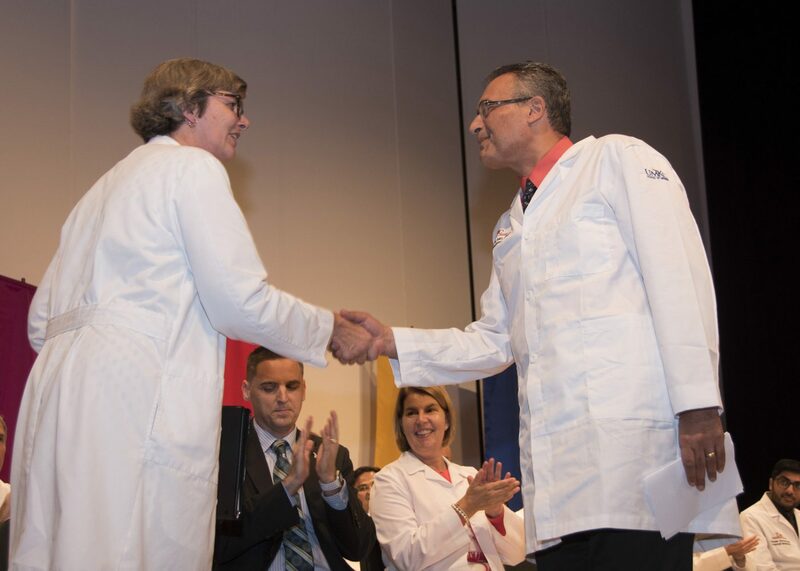 Amgad Masoud, M.D., was honored as recipient of the Outstanding Year 1 and 2 Docent Teaching Award at the annual White Coat Ceremony on Aug. 6 at White Recital Hall. The award represents exceptional teaching and the pursuit of excellence in medicine. Its recipient is chosen each year from student nominations. A member of the School of Medicine Years 1 and 2 docent team since 2010, Masoud also received the outstanding docent award in 2013 and in 2015. 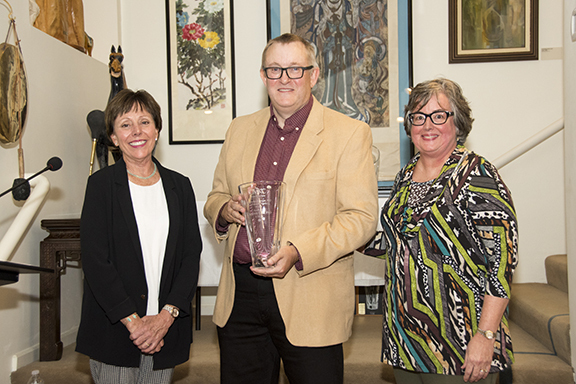 He has served as a Years 3-through-6 docent since 2008 and has received numerous other teaching awards, including the Excellent Teaching Award for Internal Medicine Residency Faculty and the Resident Teacher of the Year Award. Before joining the UMKC faculty, Masoud completed an internal medicine residency at the UMKC School of Medicine after earning his medical degree from Cairo University School of Medicine and serving as an attending physician in internal medicine at Al Salam International Hospital in Cairo. The American Heart Association has awarded a $154,000 grant to UMKC School of Medicine scientist Mingui Fu, Ph.D., to conduct a two-pronged study that could lead to the development of novel therapies for vascular inflammatory diseases. An associate professor in the Department of Biomedical Science, Fu has been studying the molecular process that leads to atherosclerosis, a thickening of the artery walls created by the buildup of plaque. Atherosclerosis is a common underlying issue surrounding cardiovascular disease and stroke. While some therapies have proven beneficial, there are currently no available treatments to reduce the early steps that lead to the formation of these abnormal arterial masses. Fu’s new study will explore at a molecular level the process by which a particular protein, TRIM65, has been found to target those molecules responsible for regulating inflammation, antivirus and cancers. The research also seeks to determine how the loss of the TRIM65 protein affects the adhesion of those abnormal fatty cells to arterial walls to produce atherosclerosis. If successful, Fu’s study will define a regulatory pathway of endothelial activation and provide insights for developing new therapies for vascular inflammatory diseases such as atherosclerosis. 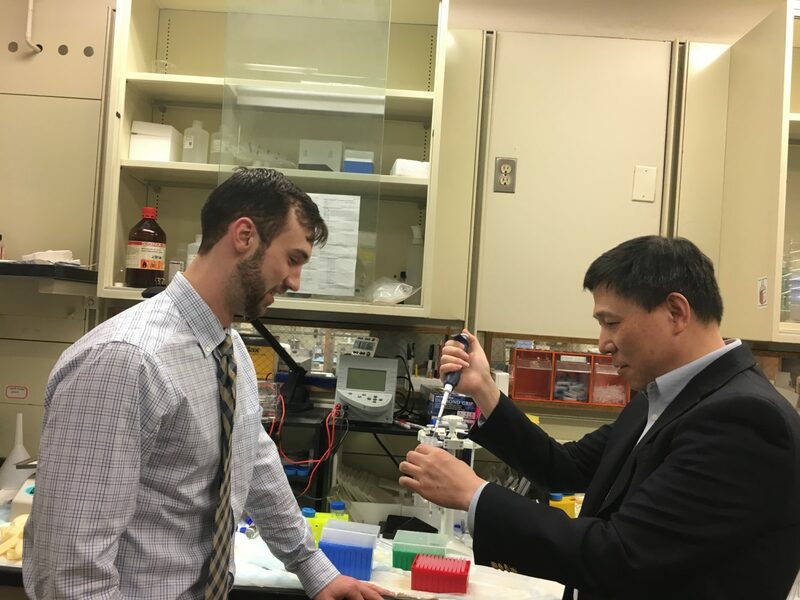 Recently, Fu and his research lab at the School of Medicine published a paper in the journal Scientific Reports that revealed the discovery of a novel secreted protein in body fat tissue that displayed a potent anti-inflammatory role in immune cells and vascular endothelial cells. In addition, he also has published a review article in Nature Reviews Immunology about RNA-binding proteins in immune regulation. According to a 2017 report by the American Heart Association, cardiovascular disease is the worldwide leading cause of death and is an underlying factor in nearly one-third of all deaths in the United States.